The kneeling figures with arms outstretched, wearing flowing robes secured at their waist and above the elbow. Major General Georges Burns, K.C.V.O., C.B., D.S.O, O.B.E. and M.K., North Mymms Park, Hatfield, Hertfordshire; Christie's, London, 30/11/1967, lot 16. M. Baxandall, 'A Masterpiece by Hubert Gerhard', Victoria and Albert Museum Bulletin, vol. I, no. 2, London, April, 1965, pp. 2-19. 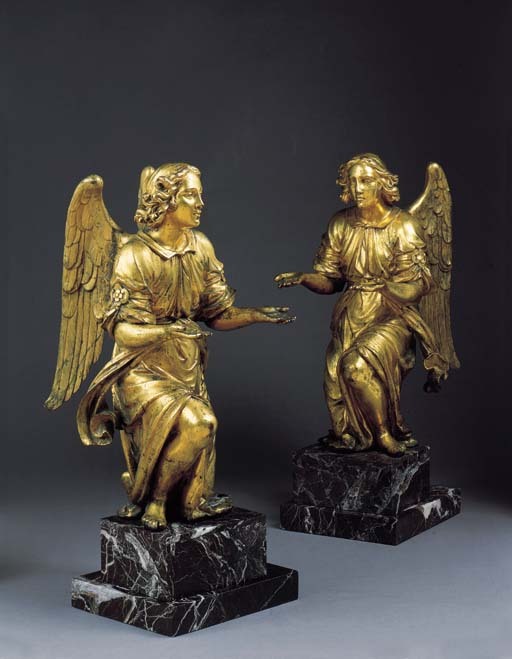 When these large, gilt-bronze angels were sold from the collection of Major General Sir George Burns in 1967, they were described as 'Roman or Florentine'. At the time they were exhibited at the Royal Castle in Warsaw, it was suggested that they were by Hubert Gerhard, a follower of Giambologna's, and that they formed part of the altar which Gerhard created for the Fugger banking family in the Dominican Church of St. Magdalena at Augsburg in 1581-84 (Warsaw, loc. cit). However, the surviving elements of the Fugger altar, now in the Victoria and Albert Museum, betray Gerhard's formation in mannerist Florence to a much greater extent than is evident here. The present bronzes, with their broader proportions and greater sense of balance, appear to have been created by a sculptor more influenced by the classicism of Rome.